Maria Everding announced the publication of Panache That Pays on ABC’s Good Morning America. Panache That Pays is fun, concise, easy reading. Forget lengthy, traditional etiquette books with their rigid stylized rules that drag on for 700 pages and are written for people already in the workplace. Panache That Pays is written for the college senior and the young professional – the “new kid on the block” who needs more than a degree and a knowledge of who’s who to get where he or she is going. Panache That Pays will guide and direct the recent college graduate, who is academically qualified, but lacks the necessary people skills to survive in the real world. Alphabetized by topic for quick reference and illustrated with cartoons to add humor, Panache That Pays is a concise 133 pages of fun, easy reading. Panache That Pays is filled with today’s solid business etiquette basics – yet is small enough to fit into a briefcase, a coat pocket, or even under a pillow! Order this enjoyable, informative guide today! Panache That Pays (ISBN 0-9617665-1-4) is available via The Etiquette Institute. 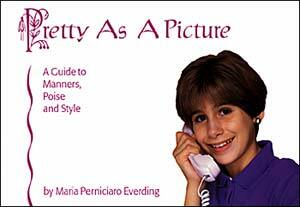 Maria Everding also authored Pretty As A Picture – A Guide to Manners, Poise & Style for Young Ladies, the accompaniment to the popular Pretty As A Picture course. This book is no longer in print since the program was sold in 2004. I Have Manners from A to Z is a shared effort of Trenetta Robertson and Maria Everding to create a book for young ladies and gentlemen that is fun and energizing, while teaching them basic social skills. 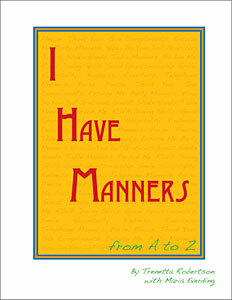 I Have Manners from A to Z focuses on knowing the proper way to handle a social situation and the confidence it brings. Arranged alphabetically for quick and easy reference, this is the ideal guidebook for today’s youth.